The Carrara marble remains to be one of the more popular choices among building plans, interior decor, and sculptures. The Apuan Alps is a mountain range that is home to over 300 marble quarries. The quarries are said to be covered in Nature’s ‘eternal snow’. The marble quarries have been the source of the Carrara marble for over 2,000 years. People say the mountain range has the appearance of being covered in snow due to the visual effects of the gleaming white marble quarries. The white marble quarries are situated on the valleys Miseglia, Torano, Colonnata, and Bedisano. White Carrara marble has been sought after since as far back as 177 BC when Romans would travel to Luni with slaves in order to extract the marble. The Romans would ship the marble back to Rome to be used in the construction of various palaces and monuments. Much of Rome had been brick huts prior to the use of Carrara marble that made many of Rome’s buildings so beautiful. The Renaissance was a very popular time for Carrara marble. Michelangelo even used this white marble for his sculptures. It is said that Michelangelo traveled to Italy to extract Carrara marble himself from Serra gorge. Serra gorge is said to feature the whitest marble with thin, dark and gray veiny patterns running through it. In the 14th Century, stonecutters used a technique called ‘Lizzatura’. They would use wooden tools to drill holes into the stone. Stonecutters would wet the wooden stakes which would then cause the stone to split into sections. Stonecutters would then use oxen to move marble blocks down the mountain range, some sections weighing up to 40 tons each. Gunpowder was later used in 1570 by stonecutters when it was introduced by the ruler of Carrara named Marquis Malaspina. This process of using gunpowder proved to be too destructive to the natural stone and turned much of the beautiful white marble into dust. This process is what resulted in much of the debris that gives the Apuan Alps the look of being covered in ‘eternal snow’. Today’s process of extracting the stone involves high-speed, diamond-edged cutting equipment and large bulldozers. The use of this equipment allows for faster extraction of the stone and better working conditions with reductions in the actual manpower that is required. 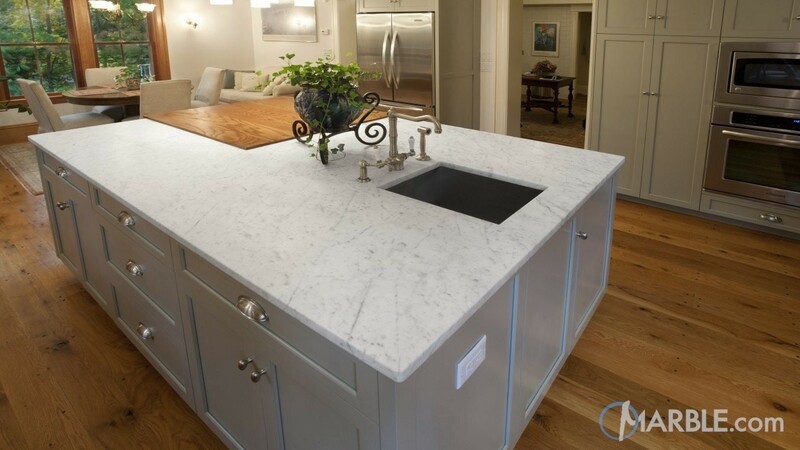 The natural stone industry’s Carrara marble is a light colored stone that is a popular choice among homeowners looking to remodel their homes or first time builders. The light colored stone is ideal for marble countertops and marble vanity tops. Carrara marble is a popular selection of light colored stone that features dark grey veins. This makes for beautiful marble countertops or marble vanity tops that can add a level of elegance to any room. Slab Market is a wholesale natural stone supplier. This is where natural stone fabricators can go to expand or restock their slab yard inventory. Slab Market allows fabricators to purchase slabs in larger quantities from some of the most prestigious quarries in the world. The product is also shipped directly to the fabricator’s slab yard in a shipping container. We have many suppliers from all around the world offering slabs making our selection Market is a great option for those looking to reduce the hassle of buying and shipping large quantities of natural stone. Buying wholesale direct from quarries lowers costs in the long run so, ill up your containers today!